When it comes to volatile battleground stock Tesla Motors (NASDAQ:TSLA) critics will tell you the company is about to collapse. Still, the big picture on the price chart of TSLA stock suggests shares may have a “full house” on their hands and worthy of bullish investors wagering a little something long on shares today. Notorious hedge fund Greenlight Capital’s frontman David Einhorn came out this past Friday stating Tesla’s “wheels are falling off” and it is on the brink of failure. His firm of course hopes for the best as only a bear can. Greenlight has been short TSLA stock for more than three years. The vocal Tesla critic went on to call CEO Elon Musk “erratic and desperate” and likened the EV upstart’s path as the same one taken by doomed financier Lehman Brothers as the company’s reputation for poor quality, service and shrinking tax incentives will drive shares into the ground. I guess we’ll find it next week when TSLA’s earnings report is delivered as planned, unlike its famously cool automobiles. If you’re betting alongside David Einhorn, who also happens to be a well-known poker player, you’ve been enjoying a good hand going short TSLA stock in 2019. But Greenlight’s time spent nurturing its short position hasn’t been nearly as profitable. The bet against Tesla remains wildly in-the-red and put the once-mighty hedge fund, ironically enough, on the brink with its investors the past couple years through 2018. And while 2019 is proving different thus far with TSLA stock off about 15% since January, will the profitable short continue to gain traction? Looking at the big picture of Tesla’s monthly chart, the technical interpretation is that bears like Einhorn may have another challenging detour, before and if they receive any lasting vindication. This view of TSLA stock shows three longer-term layers of Fibonacci support backed by a pair of key trend-lines and a teaser of sorts with stochastics nearing an oversold crossover signal. As such, I’d estimate the technical picture looks like a full house for today’s down and out bulls. For like-minded contrarian investors willing to wager against this year’s downtrend in favor of the larger bullish narrative on the TSLA chart, I’d recommend taking a test drive with a smaller long position for now. With Tesla’s historically volatile earnings-driven swings right around the corner, small position sizing is a win-win regardless of the outcome as investors have a stronger out if needed, but can also build up the pot size if more favorable conditions emerge. 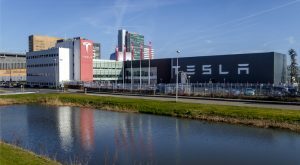 Article printed from InvestorPlace Media, https://investorplace.com/2019/04/this-is-a-bet-on-tesla-stock-thats-actually-worth-taking/.